The Rhythm of Ireland School hosted their annual feis Sat Oct 18-19, returning to Williamsburg after a one year hiatus (held in nearby Portsmouth in 2013.) This review covers the Championship competitions on Saturday. This feis returns to the original location, The Doubletree by Hilton (formerly a Marriott.) The venue is spacious, with large ballrooms for competitions, vendors in the hallways outside the ballrooms and the auditorium. A good feis rate was offered for the hotel, and some rooms were extremely spacious. This feis also offers itself as a weekend destination for the whole family, with much to do for the entire family. Many feis goers enjoyed the outlets, Colonial Williamsburg and Busch Gardens before or after competitions. Preliminary Champions were in one ballroom, and Open Champions in another ballroom, and for this reason, music was very good because there was no competing music for dancers to hear. Sets were held on a dedicated stage in the auditorium. Stages were raised and covered with a painted material to help with slipping. Although I did not witness any falls, some dancers did say floors were slippery. Stages were also adequate in size for champion dancers. The feis began at 8:30am. Stages seemed to be moving at a good pace until there was a delay on Stage 1 before the Prelim U12 competition. Unfortunately, these dancers were dressed and in their chairs for 45 minutes before competitions resumed. The dancers did their best to stay warmed up during this delay. Awards will be discussed later, but having awards between set dances on Stage 5 delayed award presentations and flow of this stage. However, it did ensure dancers that they would not miss their awards while waiting for their set. Sets were adequately scheduled to ensure there were no sets missed due to competition. Food was plentiful and with a variety of options at the Doubletree. There was a cafe, a vendor offering hot dogs, hamburgers, salads, sandwiches, etc. outside the cafe at normal hotel prices. There was also a sports bar and a restaurant available for dining. And outside food was permitted. We did a combination of purchased food and food we had brought for our room. Vendors were plentiful and a nice variety. There was a shoe vendor, hair vendor, jewelry, air brushed t-shirts and various clothing vendors. There was nice spacing between vendors as well. As standard with PC/OC competitions, there was a panel of three adjudicators. I have heard that many comments were given to Prelim dancers, but few to none to OC. This close to Oireachtas, dancers need comments to make the appropriate corrections in the coming weeks. By seeing my dancer’s score sheet, all three judges were in consensus with scoring and two of the three gave comments. All comments I have heard (and experienced with my own dancer) are that the adjudicator dedicated to sets gave many constructive comments to each competitor. This is so helpful this close to Oireachtas, and is offsetting the lack of comments on the OC competitions. There was a dedicated musician to each stage and separate rooms for each competition. No complaints here for the musicians. As mentioned previously, awards were announced between set competitions, which slowed down award presentations, and also delayed sets. Times were posted in the hallway and announced in the ballrooms. It was nice to have a spacious room for all to comfortably fit inside and see award presentations, and the podium on the raised stage. Awards were given to the top 50% of each competition. Awards were very nice and different than the usual trophy. Open Champion placers were given silver engraved plates. Preliminary Champion placers were given glass plaques. Top three competitors for both PC and OC were given sashes, however no place was printed on the Prelim sashes, which would have been nice. Announcements were loud and clear. It would have been nice to have a dedicated feis photographer of awards, since there was much space between the raised stage and the audience. Also, results were all emailed by Efeis by late Sunday afternoon. I agree with the grades review on this feis here. A big opportunity was lost when ROI failed to utilize Facebook or Twitter with updates and results. Also, the competitor list published had many misspellings of names. I feel as if I must review the ROI volunteers. 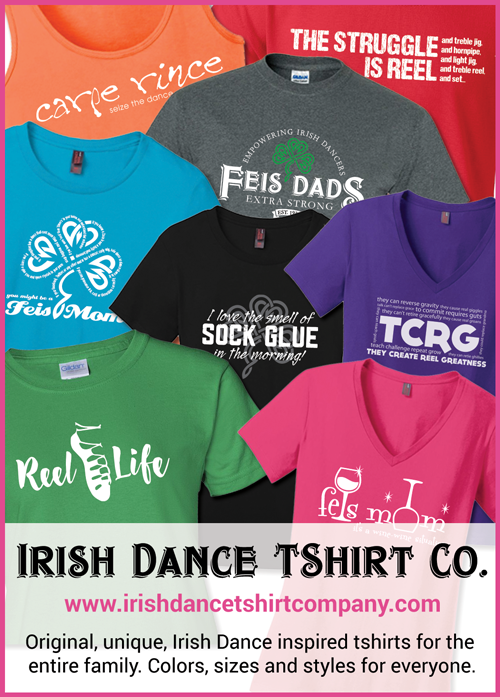 I have been to this feis many times, as both the parent of a grades dancer and a champion dancer. These volunteers are top notched. They were willing to help any family who asked and solve the issues. They also each year run a very fun costume Treble Reel part on Saturday night. This year ( and possibly also in the past?) it was judged by Maureen Bakke, who is an incredibly supportive adjudicator. She gives each team positive feedback. Each competitor receives a treat and awards are given to best overall performance/choreography and best costumes. ROI also does their best to make this a destination feis for the entire family to enjoy. This has always been one of our favorite weekends. The feis may have some glitches throughout, but it is rare for a feis to not have any. We always make this a long weekend and enjoy Williamsburg on our off-feis days. It is also welcomed to be back in Williamsburg. Our thanks to the ROI family for another well done weekend.